Water scarcity in any other part of Nigeria may not raise eyebrows but for a city like Lagos surrounded by water, scarcity is an issue that will continue to be a source of agony for residents of the state. For many parts of Lagos, there has not been water supply in the last one month, a problem that is forcing many people who depend on government-supplied water to seek different ways to cope. Mostly, residents’ pockets are taking the hit. On Tuesday, Lagos State House of Assembly summoned the Managing Director of the Lagos State Water Corporation, Mr. Mumuni Badmus, and the Commissioner for Economic Planning and Budget, Mr. Akinyemi Ashade, to brief members on the cause of the shortage and how it is being tackled. Many residents of the state, who spoke with Saturday PUNCH said the country’s economic crunch is enough headache for the people. “I buy fuel at high price to power my generator for home and my business. Everything is expensive, now I have to depend on water vendors who sell a 25-litre jerry can of water for N80. What kind of country is this now?” a resident of Ketu area of Lagos, told our correspondent. This same frustration is echoed in the complaints made by other residents, who spoke with our correspondent about how they have been coping as a result of the scarcity. Over the last six months, there has been a recurrent problem of water scarcity, which the Lagos State Water Corporation ascribed to either low power allocation or facility upgrade. But this latest scarcity has been blamed on the inability of the corporation to access funding from the budget. While the problem persists, the amount of money residents of Lagos have had to spend on water supply continues to mount. 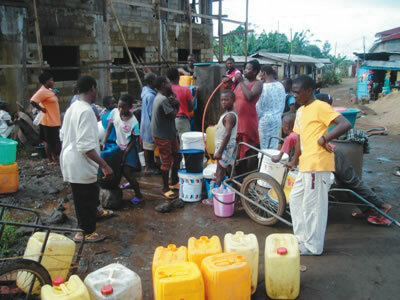 A resident of Amuwo Odofin, Ifeanyi Chikodi, told Saturday PUNCH that it had got so bad in his area that residents now pay extra just to get prompt service from water vendors. Chikodi said, “Water vendors give preferential treatment now. You have to beg them to serve you first if you are in a hurry to go to work. So, what you do is to tip them. Then of course, the price of a 25-litre keg ranges between N70 and N100 depending on how desperate the vendors think you are. The scarcity is also forcing residents of the state to be creative. When fuel scarcity was at its height, Lagosians were forced to load their vehicles with many empty jerrycans everywhere they went. The same is repeating itself now as a result of the water scarcity. An accountant with a telecommunications company, Mr. Kunle Adegbolu, told Saturday PUNCH that he keeps four large jerry cans permanently in his vehicle in case he finds water anywhere. “I buy at least five jerry cans of water for the use of my family every day. Unfortunately, there is no borehole in my house. I would have been able to fetch water at work but I don’t take my car to work daily. In April 2016, Lagos was hit by a similar water scarcity that made the residents of the state question how a city surrounded by water could “suffer thirst”. Few months before that, in November 2015, it was the same situation, as the state battled frustrating water scarcity. The governor of the state, Mr. Akinwunmi Ambode, said at the time that water scarcity would soon be a thing of the past as the government worked to resolve the “technical hitches” that were causing the scarcity. The Lagos State Water Corporation, which claims to be the largest water corporation in Africa, says it supplies water regularly to 12.5m people in a state of 17.5m. But despite this claim of huge supply, a large chunk of the Lagos population still depend on water from boreholes and wells in houses where government water has not been seen for many years. In April, the corporation said it would need N3.5bn to execute its water master plan to construct additional large water schemes by 2020, which would cover the entire state, highlighting how big the water supply problem in the state is. But while the long term water plans for the state hang on the altar of government funding, along with the current scarcity, the residents of areas such as Ketu, Lagos are becoming desperate. One resident of Ketu, David Akinlabi, painted a picture of how desperate people are becoming in his area, saying people now steal water from their neighbours. As far-fetched as that may sound, one would understand the plight of people living in the interior parts of certain neighbourhoods in the state which have no wells, boreholes and are rarely frequented by cart-pushing water vendors. “Fights now break out almost on a daily basis in the compound beside my house because it is a ‘face-me-I-face-you’ kind of house occupied by tenants. Some tenants steal water from drums used to store water by their neighbours in the compound. Other residents, who spoke with Saturday PUNCH from Ojodu, Ikorodu, Ijora and Lagos Island on the scarcity, explained that water vendors are “ruling” in those areas. A resident from Ojodu, who identified himself simply as Blessing said he had become concerned about the source of the water being sold by the water vendors but did not have any other choice. “I know many of the vendors buy the water cheaply from boreholes, sometimes very far away. My problem is that, if they are getting it from somewhere far away, if they get water that is not fit for consumption anywhere closer, they would fetch it to be sold to consumers and that scares me. However, on Tuesday, the Lagos State Commissioner for the Environment, Babatunde Adejare, said the government would soon introduce a water distribution kiosk system, to improve water supply in some parts of the state. Adejare said the kiosk system would complement the five-kilometre reticulation and the existing network in the state. Saturday PUNCH learnt that the Akute IPP has a 12.15MW capacity. The facility, which is a public private partnership between the Lagos State Government and Akute Power Limited, is said to be responsible for at least 80 per cent of water supply in Lagos.